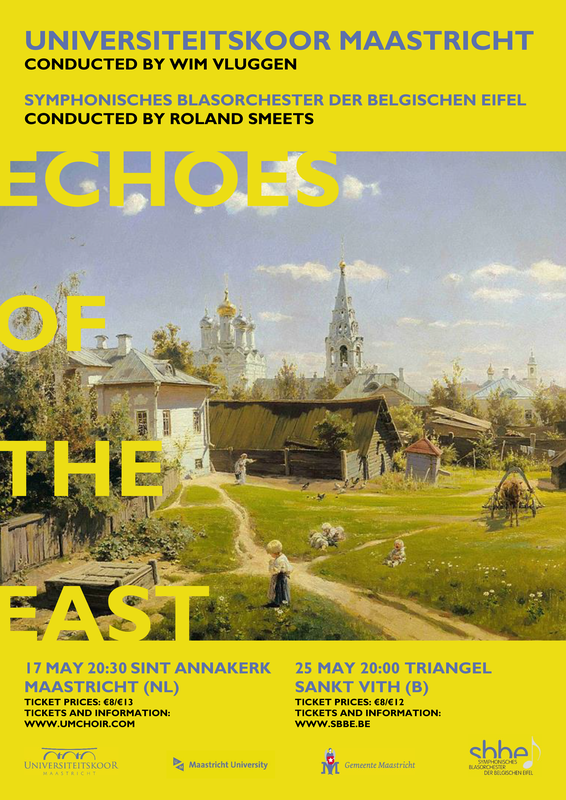 On the 17th of May, the Maastricht University Choir, conducted by Wim Vluggen, will collaborate with the Symphonic Wind Orchestra of the Belgian Eifel in order to perform their new concert: ‘Echoes of the East – Music from Eastern Europe’, featuring music from composers such as Borodin, Esenvalds, Mussorgsky, Prokofiev and Tchaikovsky. Op 17 Mei zal het Universiteitskoor Maastricht, onder leiding van dirigent Wim Vluggen, samenwerken met het Symphonisches Blasorchester der Belgischen Eiffel om hun concert ‘Echoes of the East – Music from Eastern Europe’ neer te zetten, met muziek van onder meer Borodin, Esenvalds, Mussorgsky, Prokofiev en Tchaikovsky. Please be aware that we cannot refund bought tickets. Het is voor ons niet mogelijk om betaalde tickets te restitueren. We vragen uw begrip hiervoor. The concert will be held at the Sint-Annakerk in Maastricht (Dr. Van Kleefstraat 12), where it will commence at 20:30 on the 17th of May. Het concert zal plaatsvinden in de Sint-Annakerk in Maastricht (Dr. Van Kleefstraat 12), waar het op 17 mei om 20:30 zal beginnen.